Receive up to 20% OFF Your Stay! * View our *DEALS HERE. Sunset Villa West is our most popular villa. This spectacular accommodation has everything a couple needs. It includes some of the most spectacular lines of site to the most incredible sunsets and views you will ever see. The kitchen area is elevated from the living/bedroom and features a fridge/freezer, microwave, gas oven/stove, fine cutlery, coffee maker, French press, blender, cutting boards, spice rack, and all flatware, dishes, and glassware. The living/bedroom area features a queen bed, tile floors, high speed internet, stereo, flat screen TV, Roku, ceiling fan, air conditioning, and full porch with BBQ, table with chairs, and reclining “zero-gravity” chaise lounges. There are large double doors and windows, that open to expose a fantastic view of White Bay, right from your bed! From the living room, one enters a breezy walkway leading to the bathroom with ceiling fan, large vanity, and over-sized shower. "The pictures on the website don't do the views justice. We stayed at the Sunset Villa West and it lived up to it's name with incredible sunset views from it's location perched on the hillside. It was an easy walk down a beautiful private trail right to the beach on White Bay. Bonnie was extremely helpful in the planning of our trip and rest of the staff from the airport transportation to Capt. Jesse on their private water taxi went out of their way to make sure every detail of our trip was perfect. 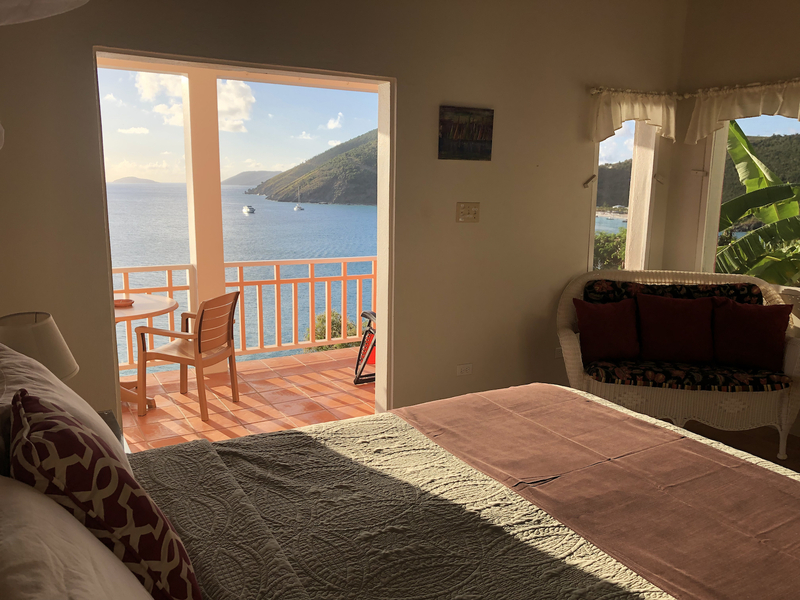 Maria the on site manager was also incredibly helpful in assisting us with provisioning the villa with everything we needed and coordinating the delivery from Tortola." Our private villas are meticulously spaced to maximize views and privacy throughout a peninsula overlooking world famous White Bay on Jost Van Dyke and the surrounding islands in the British and US Virgin Islands. Every villa captures its own unique island experience that is difficult to describe in words or pictures. A trip to White Bay Villas is an adventure you will never forget and one that will keep you dreaming of coming back. Experience the adventure and wonderment of this small but mighty island and carry on the Cool Runnings lifestyle of the Caribbean.